IN THE ANNALS OF DENIAL, it doesn’t get much more extreme than the Seekers. They lost their jobs, the press mocked them, and there were efforts to keep them away from impressionable young minds. But while Martin’s space cult might lie at the far end of the spectrum of human self-delusion, there’s plenty to go around. And since Festinger’s day, an array of new discoveries in psychology and neuroscience has further demonstrated how our preexisting beliefs, far more than any new facts, can skew our thoughts and even color what we consider our most dispassionate and logical conclusions. This tendency toward so-called “motivated reasoning” helps explain why we find groups so polarized over matters where the evidence is so unequivocal: climate change, vaccines, “death panels,” the birthplace and religion of the president (PDF), and much else. It would seem that expecting people to be convinced by the facts flies in the face of, you know, the facts. Scientific evidence is highly susceptible to misinterpretation. Giving ideologues scientific data that’s relevant to their beliefs is like unleashing them in the motivated-reasoning equivalent of a candy store. In other words, people rejected the validity of a scientific source because its conclusion contradicted their deeply held views—and thus the relative risks inherent in each scenario. A hierarchal individualist finds it difficult to believe that the things he prizes (commerce, industry, a man’s freedom to possess a gun to defend his family) (PDF) could lead to outcomes deleterious to society. Whereas egalitarian communitarians tend to think that the free market causes harm, that patriarchal families mess up kids, and that people can’t handle their guns. The study subjects weren’t “anti-science”—not in their own minds, anyway. It’s just that “science” was whatever they wanted it to be. “We’ve come to a misadventure, a bad situation where diverse citizens, who rely on diverse systems of cultural certification, are in conflict,” says Kahan. One study showed that not even Bush’s own words could change the minds of Bush voters who believed there was an Iraq-Al Qaeda link. The same types of responses are already being documented on divisive topics facing the current administration. Take the “Ground Zero mosque.” Using information from the political myth-busting site FactCheck.org, a team at Ohio State presented subjects (PDF) with a detailed rebuttal to the claim that “Feisal Abdul Rauf, the Imam backing the proposed Islamic cultural center and mosque, is a terrorist-sympathizer.” Yet among those who were aware of the rumor and believed it, fewer than a third changed their minds. This may help explain a curious pattern Nyhan and his colleagues found when they tried to test the fallacy (PDF) that President Obama is a Muslim. When a nonwhite researcher was administering their study, research subjects were amenable to changing their minds about the president’s religion and updating incorrect views. But when only white researchers were present, GOP survey subjects in particular were more likely to believe the Obama Muslim myth than before. The subjects were using “social desirabililty” to tailor their beliefs (or stated beliefs, anyway) to whoever was listening. A predictor of whether you accept the science of global warming? Whether you’re a Republican or a Democrat. Which leads us to the media. 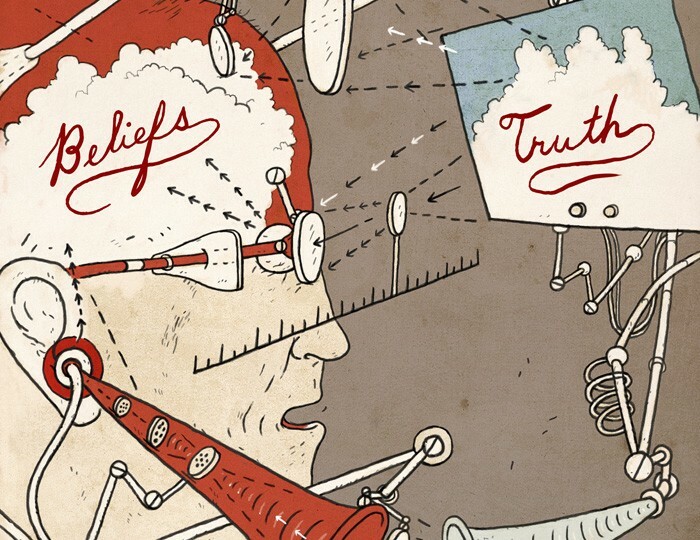 When people grow polarized over a body of evidence, or a resolvable matter of fact, the cause may be some form of biased reasoning, but they could also be receiving skewed information to begin with—or a complicated combination of both. In the Ground Zero mosque case, for instance, a follow-up study (PDF) showed that survey respondents who watched Fox News were more likely to believe the Rauf rumor and three related ones—and they believed them more strongly than non-Fox watchers. This story first appeared in Mother Jones magazine.